With the addition of the nave, the Church was completed on 22 September 1979. The combination of neo-gothic and contemporary forms of architecture provides an interesting blend of the ancient and modern. The timber featured in the nave is Tasmanian oak. The nave emphasises the need for peace and justice between nations and peoples through Christ, the Prince of Peace. 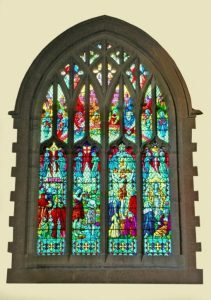 This window depicts the four main events of the life of Christ – His birth, baptism, crucifixion and resurrection. Above the four panels may be seen the Rainbow of Promise, the new Jerusalem and Old Testament figures. The smaller windows depict the apostles Andrew and Peter, St Margaret of Scotland and St Elizabeth of Hungary. Praise in the Church is led by the fine organ originally build in Melbourne by Hill, Norman and Beard (Aust.) Pty. Ltd. In 1964, the organ was modernised both tonally and mechanically and further restoration work was carried out in 1981 and most recently in 2004/5. This window is dedicated to the memory of Rueben Hill, a lay preacher in the early days of the parish, and portrays the parable of the sower and the seed. 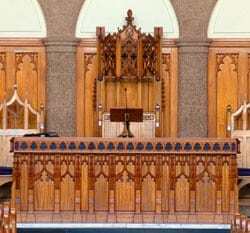 The richly carved Communion Table, Moderator’s Chair, Elders’ Chairs, Baptismal Font and Lectern all enhance the beauty of this sanctuary. The window above the Communion Table depicts the Last Supper. The timber used in the main body of the Church is dark Queensland maple. 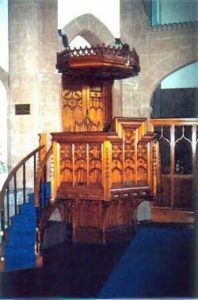 The finely carved pulpit, complete with sounding board, is used for the preaching of The Word of God. The curved staircase was added in 1955, the original entrance to the pulpit being via the doors behind the pulpit chair. The window over the pulpit represents the Old Testament (Moses and the Ten Commandments), the Gospels (Jesus) and the Epistles (St Paul and the sword of the Spirit). The Rev. Dr John Walker, who lost three sons in France in World War I, conceived the idea of a Warriors’ Chapel dedicated to all who have served their country in time of war and especially those who paid the supreme sacrifice. The unique chapel window ‘The Resurrection Window’, features service men and women being called by Christ to new life. 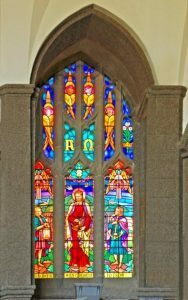 To the right of the Communion Table (a memorial to Presbyterian Ministers who gave their lives in the service of their country) is the Walker memorial window. A service of Holy Communion is held in the Chapel every ANZAC Day and it is used for private weddings and funerals. A mid-week service is also held in the Warriors’ Chapel every Wednesday at 12.45pm. A Chime of Bells was installed in the bell tower in 1968 ‘in honour of Motherhood and in memory of Margaret Rowe’. The bells are rung before every service and after marriage services. Portraits of past and present ministers of the Church may be viewed in the bell tower. People entering and leaving the Church of St Andrew must pass beneath a large cross at the main entrance – a reminder of the sacrificial death of Christ and of the need for Christians to take up their cross and follow Him. This stone is a memorial to the Very Rev. Hector Harrison. OBE. MA. BD. Minister of the Church of St Andrew from 1940-1978. This popular minister had a wide-ranging ministry which went beyond Presbyterian circles. The outside pulpit on the eastern side of the Church is a unique feature and was intended for use for large outdoor meetings and services.